I'm concerned about the stackability of the printed parts. You'd have to cut the ends very precise, before stacking them. Filling with Resin gets much cheaper by using 95% sand and 5% resin. Filling with foam and also using 5% infill would improve things alot. The foam can bond with the infill, which makes it much stronger than bonding with the inner surface alone. If you use polyurethane liquids to make the foam, instead of using the builders foam, it will foam in nicer smaller cells and harden throughout. It is also used to create sandwich constructions, so it has to harden in enclosed areas. I used it to fill my tubular chassis with foam, to make it a bit stiffer. You can also pick out of a variety of cell sizes. Different liquids have different foam characteristics. You'd have to cut the ends very precise, before stacking them. This hasn't been an issue at all. Ready to go straight off a well-tuned delta printer. Good idea on the sand! Originally, I had cutouts for a hex nyloc nut in the bottom, and a counterbore for a nut driver in the top to be able to tighten the top hex nut, negating the need for endcaps. The problem is, no matter how good the layer bonding is, the cutouts will migrate and separate away from the end faces of the extrusion; by having the hex nuts (with flat washers) resting on the top and bottom surfaces this problem was eliminated since it compresses everything. This was with no filling of foam or resin. I think that the cutouts might actually work, provided you fill the cavity with resin and sand or other fillers. This would further simplify the design and I can make the extrusion size 50mm in height instead of the oddball 40mm + endcap requirements. A cutaway view hopefully explains this better than my wording. Where the hex nut and counterbore cutout feature's perimeters bond to the top and bottom layers is one of the weak points, since these areas will be under tension when the internal tube's layers starts to compress from the threaded rod's clamping force. Edited 9 time(s). Last edit at 04/28/2018 04:08PM by klcjr89. Edited 1 time(s). Last edit at 04/29/2018 02:01AM by o_lampe. 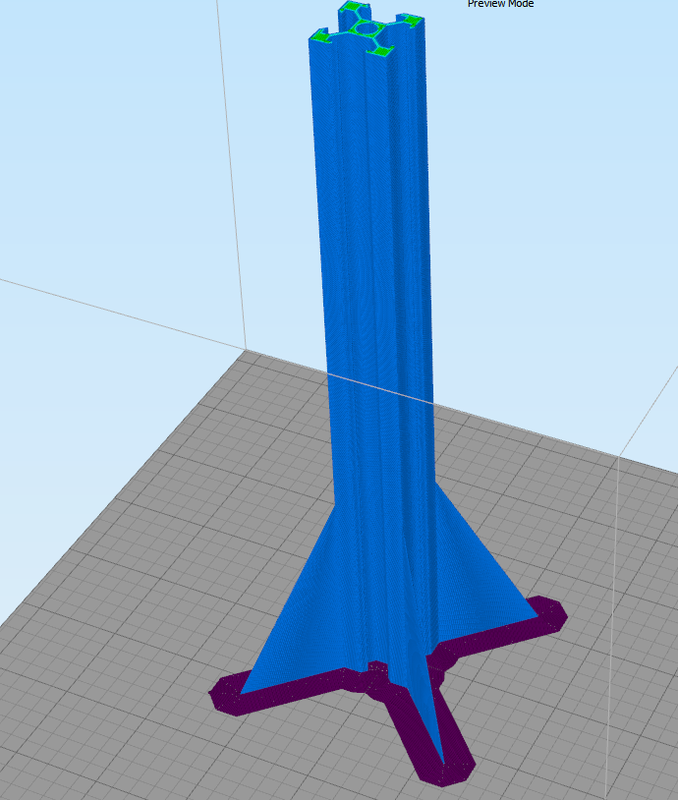 It was done to keep possible print failures at a lower point instead of printing a 300mm tall extrusion and have it fail and waste plastic. Edited 1 time(s). Last edit at 04/29/2018 02:01AM by klcjr89. What now? Do you have a well tuned Delta or not? You'd need gooood bed adhesion too. I'f you're worried about adhesion... get creative. Add some ribs to the design that are a single extrusion thick (0.48mm in my case) and then cut them off with a sharp blade. Add a brim for extra strength. Edited 2 time(s). Last edit at 04/29/2018 01:26PM by klcjr89.